Painted Hills Publishing, 9780981793610, 144pp. Gold Award 2016 Feathered Quill Book Award Dignified. Playful. Protective. Affectionate with each other and loyal. A band of horses from Wyoming's famed Adobe Town herd are here brought to life in stunning images by multiple award-winning photographer, Carol Walker. Especially memorable are the blanket Appaloosa stallion that Walker calls "Bronze Warrior" and the flashy colored mares and offspring he watches over. These are wild horses, but today, they are no longer free. In 2014, the Bureau of Land Management rounded up 1263 horses from 2 million acres of Wyoming's Red Desert. At 22, Bronze Warrior was the oldest horse captured. He and three others in his band were shipped to Colorado, the mares sent to a holding facility in Wyoming, and thier young to Utah. Moved by the horses' strong bonds, Walker joined with other advocates to intercede. This is the story--Illustrated by Walker's signature dynamic images of searching out, gathering together, and ultimately reuniting Bronze Warrior's extended family at the Black Hills Wild Horse Sanctuary. "Galloping to Freedom" will engage your heart and forever change your view of America's wild horses. 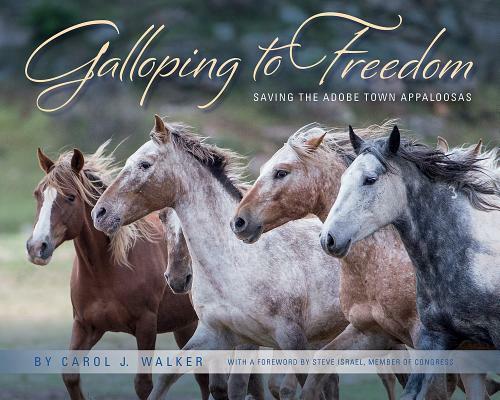 For more than a decade, multiple award-winning photographer and author, Carol Walker, has dedicated herself to following several wild horse herds in Wyoming, Colorado and Montana, documenting the family bands and their vibrant life in the wild. She is one of the leading advocates for keeping these iconic horses wild and free on our public lands. Proceeds from the sales of Carol's artwork and books fund her efforts."